Hormel Foods Corp. continues to make progress toward its goal of generating $3 billion in sales from products created since 2000. That and other company successes were noted in the 2015 Hormel Foods Corporate Responsibility Report issued June 7. To help drive strategic innovation, Jeffrey M. Ettinger, chief executive officer of Hormel, in 2000 launched the Billion Dollar Challenge, which was for Hormel Foods to generate $1 billion in sales from new products launched between fiscal year 2000 and fiscal year 2009. By the end of fiscal year 2007, Hormel Foods had more than $1 billion generated from new product sales, prompting the company to set a goal to achieve $2 billion in sales by 2012. With that goal also achieved, the company now has its sights set on $3 billion in new product sales by 2016. Hormel Foods Donation Helps Fight Hunger in Nevada Area Burke Corporation (Nevada, Iowa) donated $5,000 to the Nevada Community Cupboard and $5,000 to the Marshalltown Emergency Food Box. 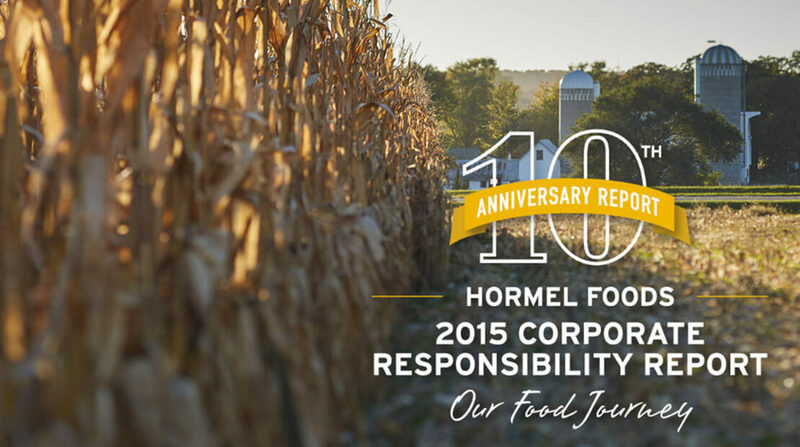 Hormel Foods Shares Food Journey in 10th Annual Corporate Responsibility Report As the company celebrates its 125th anniversary this year, Hormel Foods launched its 10th annual corporate responsibility report.